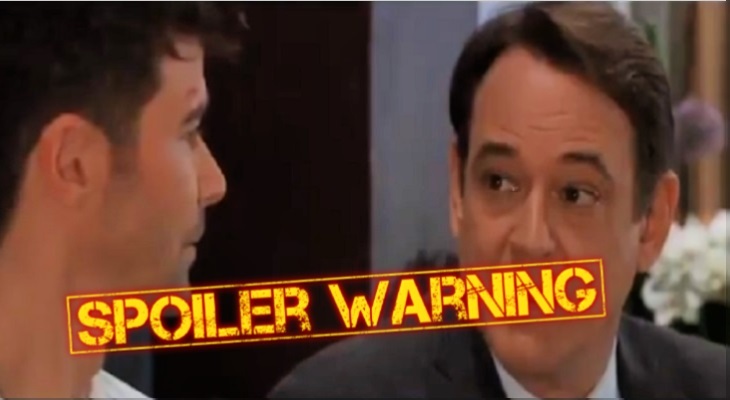 “General Hospital” spoilers for Friday, February 8, tease that Scott Baldwin (Kin Shriner) will be the best lawyer he can be. Franco Baldwin (Roger Howarth) could really use Scott’s help right about now! Fortunately, Scott will come up with a good legal strategy. He’ll tell Margaux Dawson (Elizabeth Hendrickson) and Jordan Ashford (Briana Nicole Henry) that they won’t be railroading his son after all. Scott may present some evidence that backs up Franco’s claims. Franco has been accused of the recent murders in Port Charles, so there are plenty of ways to poke holes in this case. If Franco has a solid alibi for one or more of them, that could cause a setback for Jordan and DA Dawson. However, there’s no getting around Lulu Falconeri’s (Emme Rylan) eyewitness account. Her manipulated memories revealed Franco as her attacker, so she’ll stick to her story and leave Franco in a bind. Elizabeth Webber (Rebecca Herbst) will continue to be there for Franco throughout his ordeal. She’ll know that Franco needs someone in his corner, so she’ll gladly be that person for him. At GH, “Dr. Kevin Collins” aka Ryan Chamberlain (Jon Lindstrom) will request a conversation with Dr. Griffin Munro (Matt Cohen). The fake doc will wonder if Griffin has anything he wants to share man to man. Griffin may wonder what “Kevin” is getting at, but it should become apparent that this is about Ava Jerome (Maura West). Ryan certainly wasn’t happy about that warm embrace he witnessed! Other General Hospital spoilers say Damian Spinelli (Bradford Anderson) will have some updates to pass along. He’ll fill Jason Morgan (Steve Burton) in on his latest Shiloh Archer (Coby Ryan McLaughlin) research. Spinelli will mention a story that checks out, so Jason will consider this information and ponder how to handle it. Meanwhile, Sam McCall (Kelly Monaco) will focus on her side of the scheme. She’ll keep manipulating Shiloh, but he’ll keep manipulating her, too. Shiloh will want Sam to let her walls down on Friday. He’ll encourage her to open up about her relationship with Jason, which he’ll assume is complicated. Their chat will bring some surprises, so GH fans will want to stay tuned. Over with Sonny Corinthos (Maurice Benard), he’ll follow Alexis Davis’ (Nancy Lee Grahn) lead and support Kristina Corinthos-Davis (Lexi Ainsworth). Neither one of them is thrilled about Kristina’s Dawn of Day path, but she’s a grown woman. Kristina has to make decisions for herself, even if they’re bad ones. Sonny will back Kristina up, but he’ll also want her to know he’s got his eye on Shiloh. He’ll warn that Shiloh had better take care of Kristina or else. Kristina won’t mind Sonny’s protective side coming out a bit. She’ll understand that it comes from a place of love, so she’ll just offer reassurance and gratitude. Finally, Alexis will have an infuriating encounter. She’ll bump into someone she finds completely arrogant, so she’ll be sure to tell him. It looks like this person will be Neil (Joe Flanigan), a new therapist and potential love interest for Alexis. This could be a classic hate turns to love scenario, so Alexis may be headed down an intriguing road. General Hospital spoilers say some fantastic scenes are coming up. We’ll keep you posted as other news and rumors emerge. Stick with ABC’s GH and don’t forget to check Soap Opera Spy often for the latest “General Hospital” spoilers, updates and news.